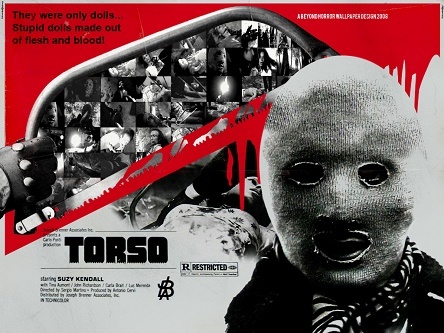 With bow saw badassery, not to mention a title that’s off the charts, expectations are high for Torso. But it falls a bit short. The whole is un-equal to the sum of its body parts, one might say. We’re introduced to the local arts scene by way of Perugino, the Italian Renaissance painter of the Umbrian school whose evocative work demonstrates “indifference to suffering,” a criticism not altogether unfamiliar to horror aficionados. And explaining the symbolism behind paintings devoted to St Sebastian (plague protector) we get a Perugia arts professor who’s bedding bodacious members of the student body. And his lectures are so compelling, students come rushing up to him after class to debate/inquire about contentious points and pursue lines of interrogation. This is altogether different from the experience both this site’s authors had as undergraduates. We couldn’t get to the campus pub quickly enough. Amidst all the book learnin’, a guy with black gloves is lurking about, indicating that we’re smack dab in giallo territory here. He’s terrorizing the townsfolk in a terrifying ski mask. And his MO consists of garroting victims with a dandy red and black cloth. Right off the bat, fingers are being pointed. Considering how prominent the jagged-toothed saw is in the posters above and below, the tool is used rather sparingly. Guess as far as horror movie weapons go, it’s more for the disposal of parts. Director Sergio Martino (The Mountain of the Cannibal God/Your Vice is a Locked Room and Only I Have the Key — say what you will, the man knows his titles) gives us less procedural than you’d expect from gialli, and way way less in terms of clothing. The Perugia co-eds doff their clothes at the drop of a scarf, and there’s also a local hippie commune where they do nothing but prance around naked, and play the bongos. There is a parade of red herrings, usually in the form of hillbilly townies to contrast the urban uni sophisticates, and the killer’s doll-obsessed. And naturally, the killer knows more about their travel itinerary than the ladies do. Speaking of travel, this film functions as a travelogue. Perugia, a university town not far from Rome, is STUNNING. This entry was posted in Horror and tagged 70s movies, Italian cinema by Really Awful Movies. Bookmark the permalink.